It can be hard to keep up with finding tough dog chew toys and fetching toys at the same pace that your dog destroys them! We’ve researched and reviewed some of the best dog toys that can stand up to rough-and-tumble play to help you make a good investment. From rambunctious puppies to high-energy adult dogs, there’s a tough dog toy out there that can handle it! First, check out these specs and features to consider to help you find a dog toy that you and your dog both like! Type: Ball, rope, and treat-dispensing toys are a few of the common types of dog toys we’ve covered in our review. Size: How big is your dog? Make sure the toy you choose is the right size for them to use comfortably and safely! Washable: Can you wash it? Some toys are dishwasher-safe or machine-washable, but you shouldn’t wash battery-powered toys. Non-toxic: Finding non-toxic toys is getting easier as more and more toys are made in North America from high-quality materials. Material: Some dogs hate rubber or are experts at ripping apart rope fibers, so take the material into consideration! Holds treats: Treat-dispensing toys can be a great way to keep your dog mentally stimulated to avoid destructive behaviors. Now that you’ve read up on the specs (you DID read them, right? If not, that hurts our feelings), let’s get into the reviews! Start out with the top pick and budget pick--both from the Kong brand, no surprise there. If that’s not enough for you, there are eight other options with great prices and durable designs. Go fetch! The Kong Flyer is the perfect combination of fun and durable, making it one of the best cheap tough dog toys around! Perfect for dogs that love fetch, retrieving, and chewing, this flexible rubber flying disc soars to great heights and stands up to your pup’s jaws and teeth. The discs come in small or large sizes and in two-packs for extra value. 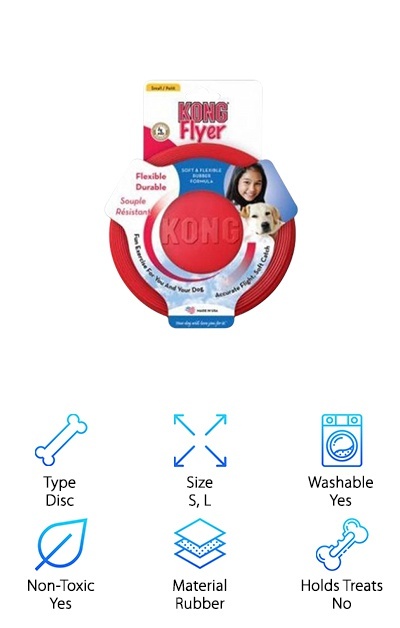 If your dog tears up typical plastic frisbees, the Kong Flyer is the ideal alternative! The small size has a 6.9’’ diameter and the large size has a 9.4’’ diameter. And if your dog has dental issues or sensitive teeth, the bouncy give of the rubber is soft on their teeth! Keep it away from bodies of water, though, since it doesn’t float. Not convinced that this is “the one?” Keep reading to compare all of your options to find long-lasting tough dog toys for cheap! If you’ve asked around about tough chew dog toys, chances are you’ve come across at least one Kong fanatic! 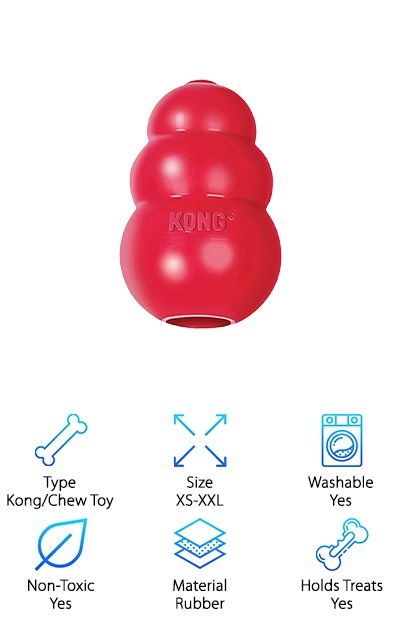 The Kong Classic is a hollow ribbed pyramid shape made of thick, dense rubber. It can be stuffed with treats, loose kibble, or smeared with peanut butter or yogurt. The bouncy rubber and curved surface make it fun to chew and resistant to puncturing. Use it as a treat dispenser that stimulates your dog’s mind or to play fetch. Your dog will use their paws and nose to coax treats out of the Kong, which stimulates their natural hunting and scavenging instincts! If your dog is an aggressive chewer, you may want to go for the Kong Extreme, featuring Kong’s most durable rubber. On the flip side, the Kong Puppy and Kong Senior toys have softer rubber designed for their jaws and teeth--there’s a Kong out there for every dog! Bonus: it’s dishwasher safe! Made from dense rubber, the Snug Rubber Balls are super tough dog toys for playing fetch. 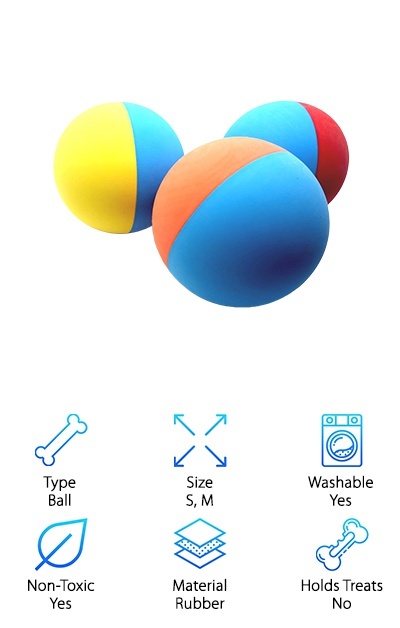 The three-pack of balls comes in a tennis ball size with a 2.5’’ diameter as well as a smaller 1.9’’ diameter that works well for puppies and smaller breeds. They’re easy to clean and made from FDA-compliant, BPA-free materials, plus they float! The 2.5’’ size ball fits in most standard dog ball launchers, too. They’re also super bouncy, so you can enjoy games of fetch on hard surfaces, indoors and out! These tough toys can hold up to light to average chewers, although they shouldn’t be used as chew toys. The ball’s size may not work well for large breeds, as it could be a choking hazard. If you’re looking for a tennis ball that won’t get grimy and soggy, the Snug Rubber Ball is a great alternative! Does your dog love noisy toys? The Pet Qwerks Babble Ball is a tough little plastic ball that makes over 20 animal sounds to entertain your dog. It’s battery-powered and automatically starts making noise when it senses vibration or moves. It also goes into sleep mode by itself when it sits still for a certain amount of time. 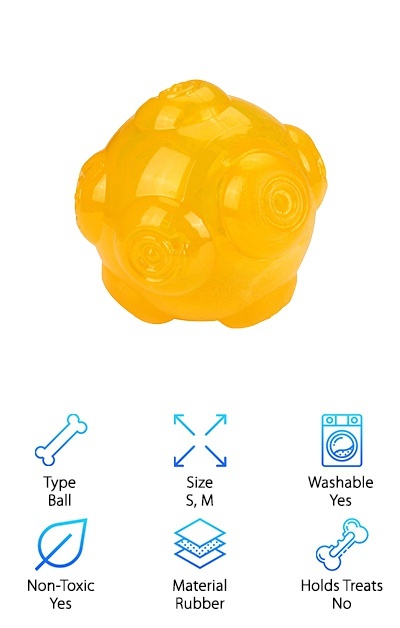 If your pup has poor eyesight or has trouble keeping a track of a ball for retrieving, the Babble Ball may help! It comes in three sizes, with the largest being 3.1’’ in diameter and the smallest being about 2’’ in diameter. So you can choose the perfect option for your puppy or adult dog based on their size. 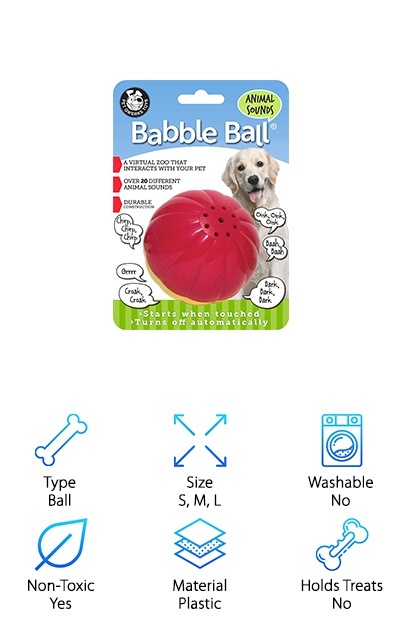 This works well for inquisitive dogs and puppies, but the Babble Ball is not a good option for aggressive chewers or large dogs that like to swallow things and is best suited for supervised indoor play. Rope toys are some of the best tough chew toys for dogs that won’t break the bank. 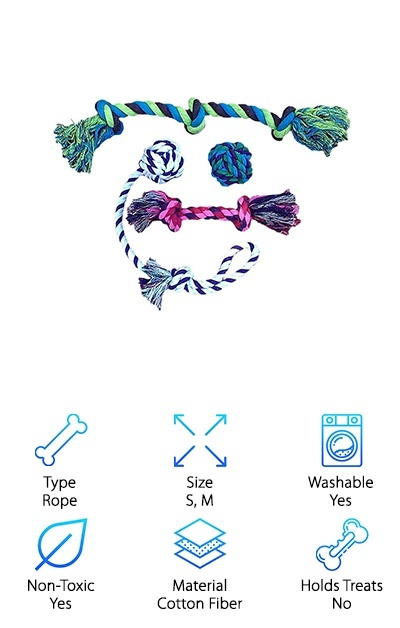 This four-pack of rope toys comes with a small 2.5’’ diameter rope ball, two knotted ropes, and a rope with a handle for tug-of-war. Bonus: gnawing on these braided ropes is great for your pup’s dental health! It’s similar to flossing for humans. Each rope braid is 1’’ wide with 2’’ wide knots, so they can stand up to the jaws of larger dogs. The rope ball is small enough that it works best for puppies up to medium breeds, but the other toys work well for dogs of any size. The tug-of-war toy features a braided ball on one end and a handle on the other so you can bond with your pup and help them burn off some of their energy! They’re long-lasting and inexpensive--perfect for dogs that love to chew! 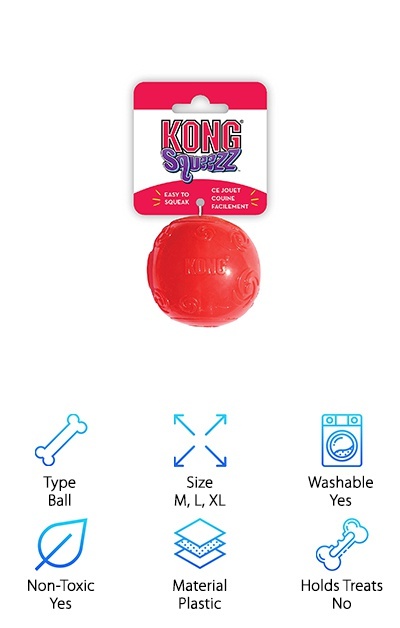 The Kong Squeezz ball comes in sizes from small to XL to suit just about any dog breed or age. Does your dog love squeaky toys, but constantly destroys them? The Kong Squeezz is one of the best durable dog toys that’s still easy to squeak. The size options start at a 2.3’’ diameter for the medium ball up to a 3.3’’ diameter for the XL ball. 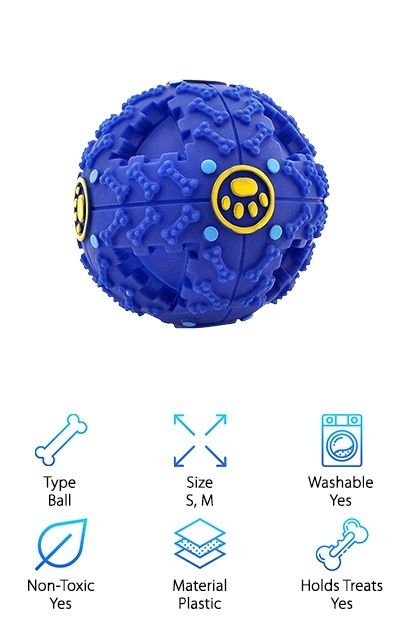 Little nubs on the ball’s surface give it a fun and unpredictable bounce that’s great for playing fetch. The ball comes in red, purple, green, and blue color options. It can hold up to light to moderate chewing and will continue to squeak even if the ball’s surface is punctured. Kong also offers even tougher models for more intense chewers, made from non-toxic rubber. Kong products are a great option for owners looking for long-lasting dog toys--that’s why they’re all over our list! The Sunny & Lucky Giggle Ball is a treat-dispensing ball that can be a great way to feed meals or snacks. Puzzle food toys help stimulate your dog’s mind and help them burn off some of the mental energy that might otherwise be spent on stealing socks to chew! The ball has a textured plastic surface and a diameter of about 10’’. It can easily hold a cup to a cup and a half of kibble. As it rolls around, magnets inside of the ball make cute, funny sounds--no batteries or squeakers required! That means it can get wet, rained on, and washed. It’s a great option for puppies up to medium-sized adult dogs, although it’s not ideal for aggressive chewers. It’s a highly durable dog toy that can be used for fetch and for feeding. It works similarly to a classic Kong but may keep your pup’s interest longer since it makes fun noises. The Mogoko Squeak Ball comes in a single pack in blue or yellow, or you can save by buying a two-pack “in bulk”! The ball has a 3.5’’ diameter and is made from durable, non-toxic rubber. You can tell by the weight--it’s heavier than a tennis ball although similar in size! It features little nubs that give it a fun bounce when thrown and provide a fun texture for chewing. If your dog loves tennis balls and squeaky toys, but you’re looking for a more durable option for playing fetch, the Mogoko Squeak Ball is a perfect combination of fun, a low price, and toughness! The nubs make it bounce in an unpredictable way, which is extra-fun when you’re playing fetch on a flat surface. If your goal is to find tough toys for dogs that can substitute for a tennis ball, this squeaky ball should do the trick! 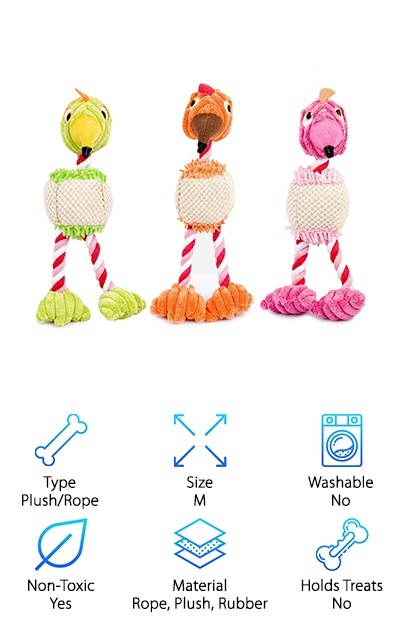 This three-pack of squeaky plush toys with rope “legs” can provide cheap entertainment for your rough-and-tumble pup! Use it for an indoor game of fetch on a rainy day, play tug-of-war, or just let your puppy shake it and toss it around on their own! Each toy measures 9’’ long, so it’s a good size for puppies and small to medium-sized dogs. They aren’t ideal for aggressive chewers. The fun squeaker can keep your dog having a grand old time with or without you involved, and the rope parts help to “floss” your dog’s teeth. These toys are super cheap and a great option for puppies and dogs on the smaller end. This brand also offers a different three-pack style of ducky plush toys with nylon and plush fabric and squeakers. If you have multiple dogs that tend to want their “own” personal toys, this three-pack can keep them all satisfied! 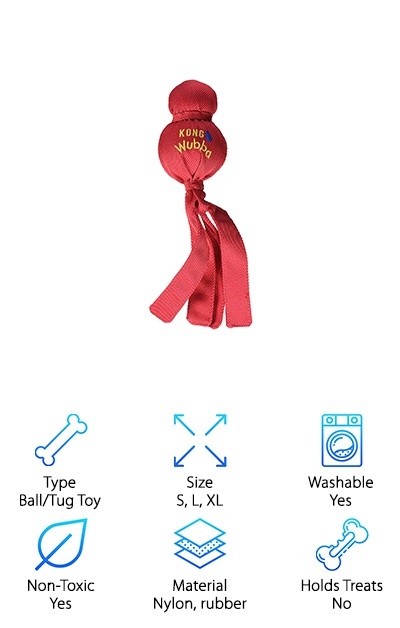 Kong is a well-known manufacturer of quality tough dog toys, and the Kong Wubba is a great choice for dogs that love to play fetch and tug-of-war but tend to be rough on their toys! The toy features two balls, one squeaky and one tennis ball, combined together inside of a durable nylon fabric with long trailing tails. Choose from a variety of size options for small to large dogs and puppies. You can even wash it in the dishwasher, and it floats for water play! The long tails make it easy to throw underhand, and it also allows you to play tug-of-war to help tire out your pup. The squeaker adds extra entertainment to help keep your dog interested. Kong toys are super tough and make for a great investment with a huge payoff! The small size is 9’’ long with the tails, and the XL is 17’’ long.